I worked with Chad Chelius to refine the CSS that would support scrolling frames in ePUB and Publish Online. Chad wrote up how to manually insert this code on epubsecrets. Then I went one step further and created a simple panel that will let you control scrolling with zero coding. The scrolling frame will work in ePUB (Fixed Layout and Reflowable), HTML, DPS, Publish Online, and in5. Thus I’ve dubbed it Universal Scrolling Frames. The panel works with InDesign CC or newer. The Universal Scrolling Frames extension is free when you sign up for our newsletter. Thank you for “Universal Scrolling Frames for InDesign” but the installer does not work on Windows 10 X64 Spanish and Spanish Indesign CC 2015 x64. As I could not install I can not comment on it. Are you using the zxp or the alternate installer? I have tested and apparently zxp installer installs but when you open Indesign follows: Error code 30477. I can not post here a snapshot of the entire text. There was an error in the initial release with international (non-English) versions of InDesign, but we posted an update last night. Try re-downloading from your original link. The latest version is 1.0.2. Send us an email with the screenshot and we’ll take a look. Thanks, this works really great! Is it posible to edit the CSS of the scroll-bars? I can’t find any place where the CSS code is written. The CSS is copied into the output as its own file. You can edit that file (inside the EPUB package). There isn’t a good way to edit the CSS with Publish Online. For Publish Online, yes the manual technique will give you more control. Alternatively, you can also attach an additional CSS file in the EPUB export dialog that overwrites the existing rules. Thanks for the scrolling bar, it works brilliantly and will help the epub! One thing though, the scroll doesn’t appear when scrolling using an iPad with iBooks. It does though when using iBooks on the Mac. Is there anyway to get the scroll bar to appear on the iPad? If the scroll is working, but not showing the scroll bar indicator, that may just be a limitation of the browser built into iBooks on the iPad. No problem, James. Happy to help! This is a wonderful thing. I have comments which might be bugs. Next, I set the image as a group with a text frame. Works. As does an image in the text as an anchored object. This will be good for my purposes. However, the settings for Hide Scroll bars is wonky. If I set it to Hide, I can’t figure out how to scroll the text with the anchored image. And if I set it to Hide with Text Only, the scroll bars show up anyway. And one more thing. The scroll bars on the right seem cut off. Re: Pasting, I did my best to match the Overlay Scrolling Frame behavior. If you think I missed something in the implementation, feel free to send my an INDD file and I can take a look. I believe the official Overlay instructions suggest pasting a Group in. Re: Hide Scrollbars, hiding the scrollbars is somewhat less useful with Publish Online because Publish Online hijacks the scroll wheel event for zooming. So hidden scrollbars is really better for touch devices (or non-Publish Online projects). The newest version (same download link in your email) sets the horizontal scrollbar to the same thin size as the vertical. In a future version, I may add a setting for the width of the scrollbar. Although, that setting is only supported on Safari and Chrome. There is a problem on windows 10, error: 800A004C. Unable to find path. Any solutions? Try reinstalling InDesign with the CC Desktop app, then open the zxp file with Extension Manager CC. This works great – thank you very much. I still can’t get the scroll to appear on iPad though… perfect in browser but simply doesn’t appear (and no scroll functionality) on the iPad. Any ideas? Thanks. Probably due to an iOS bug. Which output format are you using? Hi Justin. Created the ‘iPad web app’ first and now outputting as ‘web’. Should I use a different output method? Thanks. Your output method is fine. There will be code to address this bug in the next update. In the meantime this answer will show you how to hot fix it. I have Indesign CC 2015 running on windows 10 and cannot install this extension, i get the error message saying that i need Indesign version 9 or higher. Any tips to solve this? similarly if i use the installer file, i get runtime error, path not found(800A004C). My indesign is in dutch, i had installed it (and my extensions manager)via the CC desktop app. i really need this extension so any help will be appreciated. I’ll follow up with you via email to make sure everything’s working. Thanks for your immediate reply 🙂 I got it working now. If i install it with the extensions manager they say i need indesign 9 or higher. I think I can resolve that. Can you tell me the line number (and other info) given with the error? I have the same problem. Adobe Extention manage says that I need InDesign 9 or above… I have inDesign CC laytest version on windows 10. Is the Scroll Frame – Installer – Win.vbs producing an error for you? I have no error using the Win.vbs file (just a dos window appear for half a second, but do not see the add-on Universal Scrolling Frames. My InDesign interface is in french… Where does it show up in the english version? It should appear in the Window menu. The vbs installer should give you a confirmation when it’s done. Win.vbs(9,5) (null): The specified service does not exist as an installed service. Sorry for hassle with the installer. I’ll follow up with you via email to help you get this resolved. THANK YOU for creating this extension! I do have a question. In Publish Online the only way I could get the text to scroll was by either moving the scroll bar with my cursor, or by clicking on the text and using my up down arrow keys. This of course means you have to choose the visible scroll bar even though the panel for the Universal Scroll in InDesign offers a Hide option. I think users will typically expect to be able to scroll content with either their mouse wheel or touch gesture, but I couldn’t get that to work for Publish Online. Instead it just zoomed the content. Do you know of any setting that solves for this or is it just one of those things?? Thanks again for creating it. Alternatively, you could put your content (broken up) into Object States with buttons that “scroll” through the states. Thanks Justin. Appreciate the quick response and the potential work-around. This is one more reason for me to proceed with purchasing the In5 license…I’m on the free trial right now. I’ve been navigating all the digital publishing options (which I’m new to) to see what meets all my needs. Your extension solves the scrolling text issue I had, and now I’m just waiting for help (via the Ajar Answer Exchange) on an issue I’m having with the lightbox in In5 (when I select to show external links in a lightbox, I get a blank/white lightbox with no content in it). Because this is a key feature for my client, I must make sure that works before I commit. I’m only still playing around with Adobe Publish Online because my client needs to see updated links often and Publish Online gives you a link that is quickly/easily shareable. With In5 the link generated for preview is only good in my default browser on my computer where I have In5 installed. If I email that to someone they can’t use it to view. I don’t really want to go through uploading the asset files to my server every time I have to make an edit and send a revision to my client. Is there something after I purchase the full In5 license that gives a quick link I can share? I’m having to do a bit of a work-around right now with Publish Online for review purposes while I get initial design approvals. I realize I’ve just asked a completely different question, so let me know if I need to post elsewhere. Thanks! I posted an answer to your exchange question. We plan on making uploading much easier in v3 of in5. Thank you, Justin. Greatly appreciate your patience with the questions as I learn. I’m getting there! I also watched your lynda.com tutorial on HTML layouts which was extremely helpful. Do you have est. timing on when you’ll roll out v3 of In5? No problem, Bridget. I’m happy to help. I’m hoping to get v3 of in5 rolled out in June. Great! Look forward to it. Thanks, Justin. Hi! I just installed the extension via extension manager (mac, InDesign CC 2015) and can open the Universal Scroll window just fine in InDesign. The problem however is that there are no settings/options in the panel, just the short info text on how to use it. Have I overlooked anything, do I have to do anything specific to use it? Or is the extension maybe not compatible with the newest version of InDesign? The panel is designed to work like the (DPS Folio) Overlays panel. Once you paste a textframe or group (using Edit > Paste Into) the options will appear in panel. to see if there is progress on the subject of functional activation of html inserted when exporting EPUB3; It would be very valuable to encourage the publication in that format. Thanks for the comment. That’s still on hold. Most of the functionality will go into in5 first, then I’ll take a 2nd look at the EPUB format. It would likely require Apple removing a few restrictions they have for EPUBs on iBooks for the iPad before it’s really worth it. Just great ! 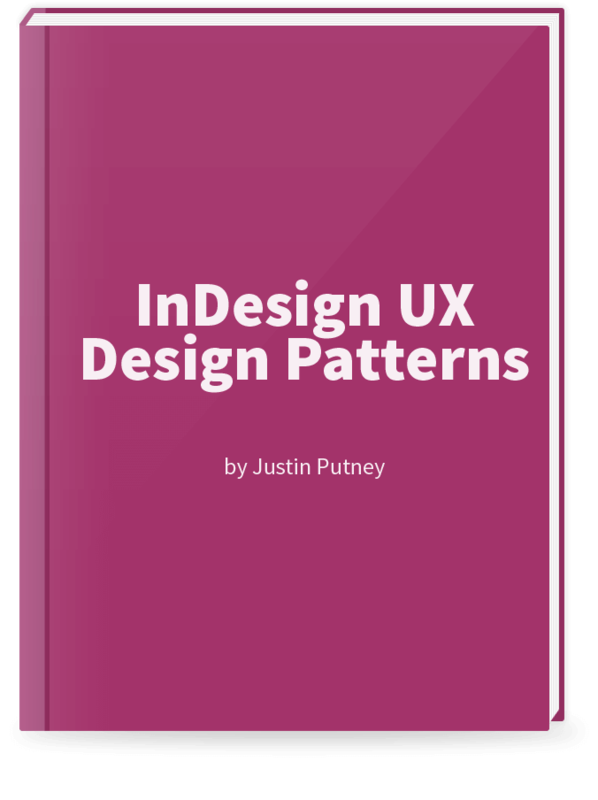 It’s very simple to use and it works very well in the epub done with Indesign CC 2017. Thank’s very much to the team. Thanks for the feedback, Niko. This works great! It’s very simple to use and it works very well in the epub done with Indesign CC2017. In iPad, when the pages appears, the scroll takes a second to activate. Is this normal? Can be avoided in any way? Perfect in browser, using iBooks too. The tool already applies pure CSS—which is immediate. So the delay is likely from the reader, not the code, and there probably isn’t way to remove the activation delay that you’re experiencing. Hi, Im new to your site and extremely grateful for your efforts. Is there a tutorial that shows how to use it. after i installed it (indesign 2017) i can’t seem to locate it. 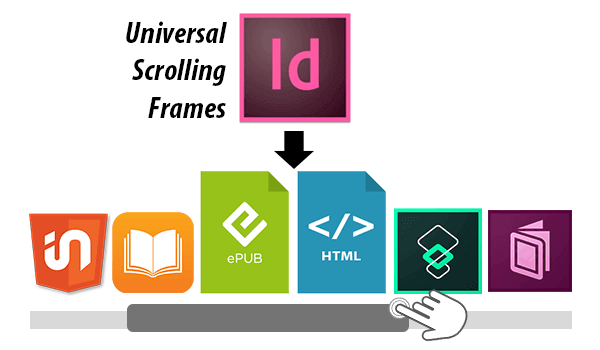 After you restart InDesign, it will be under Window > Universal Scrolling Frames. Hi Justin, thanks for responding..
Im not seeing > Universal… in the windows panel. I do however see that the script is installed. Never mind.. thank you, i just realised it was a different script. I have windows 10. Not sure what is supposed to happen but I dont think I have it? Check your spam/bulk folder for the confirmation email. Hello! Is it possible to change the color of the scroll bar? In some cases, i.e., webkit browsers, you can attach your own custom CSS to color the scroll bars. I was able to change the color of the scroll bar when using Publish Online but I now have a vertical and horizontal scroll bar when I only need to scroll vertically. Any suggestions to remove the horizontal bar? That may be due to the customization. A wider vertical scroll bar could theoretically trigger a horizontal scroll bar. Make sure you’ve selected “vertical” in the Universal Scrolling Frames panel. If that doesn’t work, try tweaking your custom CSS. Hey, this is such an amazing plugin, thank you!!! Do you know if it’s possible to widen the clickable area of my vertical scroll bars? I’m using Publish Online, and in order to move the scroll bar, you have to click on a very narrow set of pixels. If I could go into the CSS to edit the width of this while still keeping the width of the actual scroll bar the same, that would be great. I’m just trying to make sure my clients will have an easy time figuring out that it’s clickable. There isn’t a reliable way. Only certain browsers let you style the scroll bar. That’s a good option, Jake. Object States will give you full control of the appearance. I installed it in cc 2017.1 with extension manager CC. However it’s not showing up in the window panel, even with docs open the work with? Installing with CC manager gave following error: “no data in database”. Use the “CC Installer” with the download instead. Bad luck. The alt installer (windows) doesn’t do anything. I cannot select a version, and accept and install does nothing. Any other options? I replied to your email. That’s the best way to follow up on individual issues. Great work on this product. I am experiencing problems with universal scrolling frames within a document that I created a few months ago. The initial scrolling frames were created a few months ago with Universal scrolling frames— these are indeed working properly, but I am unable to create new scrolling frames within the same document. I can, however create scrolling frames in a new document. My question is why is the universal scrolling frames not working now on new scrolling frames within a document that I created a few months ago. Any ideas? Can’t say for sure. Feel free to follow up with me over email. Thanks for this extension. Unfortunately, when i try to publish online, the scroll function doesn’t work! Any suggestions? Send me a URL and I can take a look. I’ve seen this plugin working fine in ID CC 2017 and it’s awesome! I just updated InDesign CC 2018, but now when I’m trying to install this plugin for the very first time, it says “No compatible versions of InDesign found”. First I was blaming InDesigns update, but then I saw Alexandres comment and I guess it should be working. Check your email for the original download link. You should be able to get the updated version from that link with a 2018-compatible installer. I subscribed and downloaded the installer, but it keeps saying the same. The mac-installer seems to be updated 9-25-2017. Hmm…mine shows CC 2018 in the list. First, you’ll probably need to be an admin on the system to install them. Second, you’ll need to be sure that the InDesign applications Scripts folder (and subfolders) have read and write access enabled. You do this by opening the Get Info window in the Finder (CMD+i). Still doesnt work. I am having the same problem. The content already paste into content frame. Thanks for the script but i cant seem to get it to work. Ive been trying for the last hour or so. Its installed in Indesign CC2017 but no functionality in ibooks on both desktop or ipad. I also have the problem with Premission denied. I still doesn’t work when having done everything you have recommended. HI, i tryed to cut, and paste my group of objects into a round frame but when i choose universal scrolling frames the instruction window appears on the screen. I watched a tutorial on youtube and the man after this windows had a click on the frame and had been shown a new window with all selection (vertical…. etc) …can you help me ? I am having the same trouble as all the above comments, when I download the universal scroll and go to install this notification pops up. I have done everything you have already recommended in previous comments and still nothing. Try applying the permissions “to the enclosed items.” That part is key. Please see answers in comments above. I haven’t been able to work on it for a long time, but it made it easier to work. Thanks to you, I can do a great job. I have the new version of Indesign 2019 but this extention doesn’t work on it is there a new version comming soon? The click listening that the button does may interfere with the scrolling. I would suggest putting the scrolling frame in an MSO instead. (This works better with in5 than it does in Publish Online).